Includes 3 center axis LED's in one light (1 x 850nm Infrared, 1 x 940nm Infrared, and 1 x Red) - see details below! *Note; the IR (Infrared) illuminators are not visible to the naked eye. You must use this illuminator in conjunction with a night vision device. 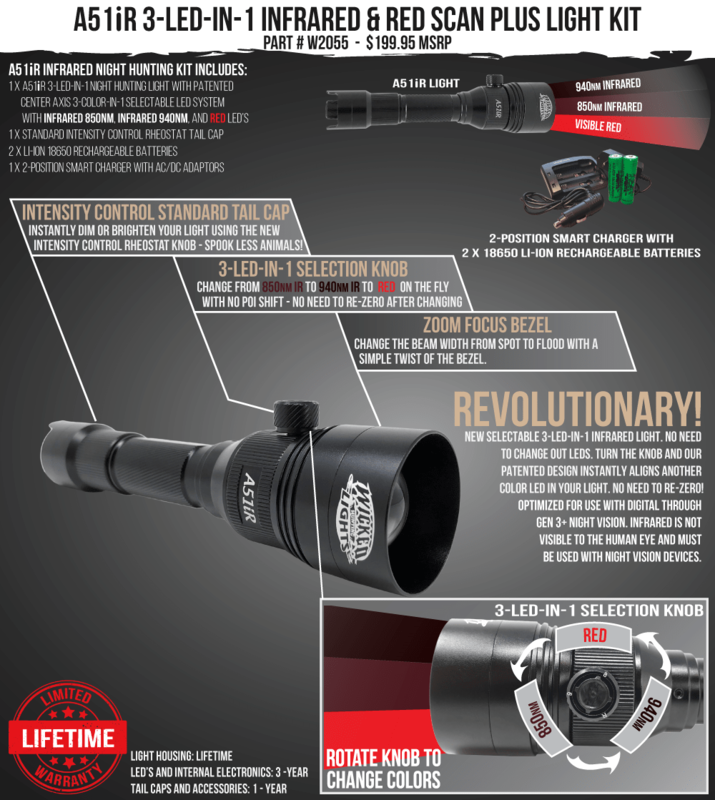 Wicked Hunting Lights is proud to announce the release of the ALL NEW Model A51iR Ambush Hog & Predator hunting light featuring Patented Center Axis Rotational 3-Color-In-1 Selectable Color LED module with LED Position Detent Lock, Zoom/Focus, and Full Intensity Control. The A51iR’s revolutionary patented design is the FIRST EVER purpose built night hunting light to combine all THREE KEY DESIGN FEATURES required in a professional quality dedicated scope mounted shooting light. The first key feature is the revolutionary, Patented 3-in-1 Center Axis Rotational Color LED module with LED Position Detent Lock. 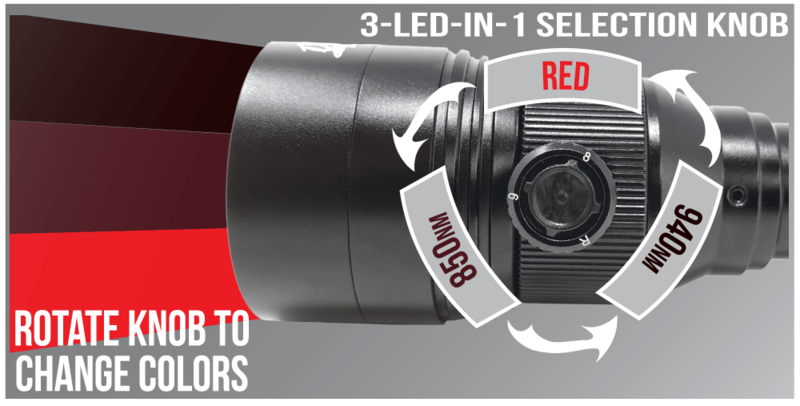 In laymen’s terms, you have the ability and convenience to select any of the 3 colors (for example 850nm IR, 940nm IR, or Red) with just a slight twist of a knob and have the LED color of your choice lock in place on the center axis of the light body and in the center axis of the spherical lens. ​Why is the “center axis” so important you may wonder? First, if the LED is not centered in the center axis of the spherical lens, then the light will not reach its maximum potential in light output (as measured in LUX). Depending on how far off axis the LED is, it will also create an artifact or distortion in the light beam which can affect your field of view when looking through a scope. However, the most important reason for center axis selectability and repeatability is when you mount your light on your scope. With a traditional, single colored led that is centered in the light, you will adjust the windage and elevation so the light is centered in the field of view of the scope (and thus centered on your crosshair). Because one LED is used, and that LED is centered in the light, you can line your crosshair up fairly easy. With a multi colored LED module, you will want each LED centered in your crosshair the moment you change to a different color LED without having to re-zero the light in your scope after each color change. Currently LED color changes are accomplished in one of two ways; (1) physically remove the light bezel and change the LED module or (2) utilize a fixed circuit board with 4 (or more) different colored individual LED’s placed as close as possible on the board that some manufacturers use. With the A51iR Ambush Light you can effortlessly select and change LED colors with a quick turn of the LED color control knob. The patented Center Axis Rotation design virtually eliminating the need to perform windage and elevation adjustments to keep the light beam centered in the scope field of view when changing colors. 850nm - Advantage - Light beam is invisible to the naked eye, must use with a night division device, longer range, best option for all around night hunting when no visible light beam is desired. Weakness - Led element gives off a moderate red glow which came be seen when looking straight at the light, which could possibly alert a targeted animal. 940nm Advantage - Light beam is invisible to the naked eye, must use with a night division device, good option for moderate range night hunting when no visible light beam is desired, with very LOW LED emitter glow. very desirable for closer range hunting such as hogs over a feeder or coyotes over bait. Weakness -Reduced range. Red - Advantage - Excellent utility light color for use in illuminating trail or to aid in locating downed game while saving your night vision. Can be used with most digital night vision devices when small dust cover apertures are used and contrast and gain adjustments are set to minimize washout and over saturation as necessary. Extended long range. Weakness -Visible light. Heightened potential to spook and or alert targeted animal. NOTE: Red light is too bright for military grade Night Vision and can cause damage. Only use red with digital night vision. Why multiple LED's? You can tailor the light to meet the needs of different scenarios. For example: Use the red LED as a utility light in your vehicle to gather your gear or walk to your stand location. Then you can switch to the 940nm IR LED while scanning a small 150 yard pasture for coyote or fox or hunting over a feeder or bait pile at close range. On the next stand select the 850nm IR LED to scan a large field for hogs rooting or coyotes at long distance. Or maybe you start with a 940nm IR LED but the animal is just a hair out of range, so you switch to 850nm IR to give you that extra range and make the kill. 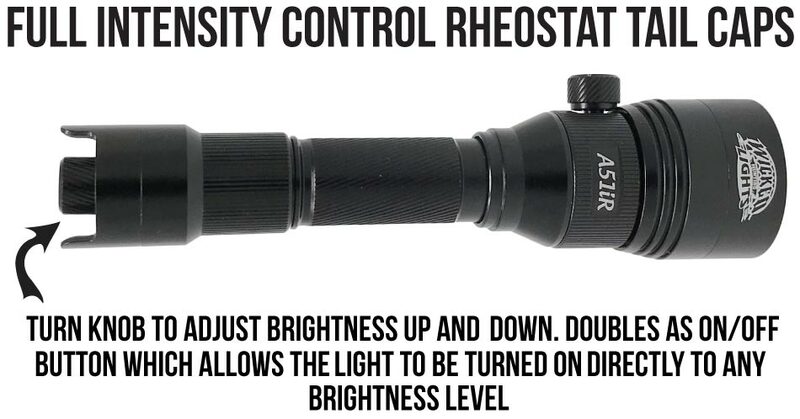 On the contrary, maybe you are using the 850nm IR LED but the particular animal you encounter is exhibiting signs of being light shy to the "glow" so you instantly switch to 940nm IR (so you don't spook the animal) all while maintaining the light output perfectly centered in your scope's field of view. With the A67iR’s patented Center Axis Rotational design, there is no need to re-zero the light back into the scope after changing colors. Less time spent fooling around with adjustments means more time spent on target and more animals down. ​Zoom Focus Rotating Bezel. The ability to adjust the light beam characteristic from “flood” to fully focused “zoom” is critically important. Typically the way the light is being used will dictate how the beam is adjusted. If the light is being used as a “scanning” light, it will be “flooded” which will widen the beam and lower the intensity of the light and aid in covering more area while looking for “eye shine”. Because the beam is “flooded” the benefit will be less potential to “burn the animals eyes” or shy the animal from the light. However, the disadvantage is the distance you will be able to see and positively identify the animal will be greatly reduced. Because of the adjustable zoom - focus you can experiment with beam size and intensity adjustment and find what works best for your particular situation and area. Additionally, many night hunters utilize two lights; one adjusted and set for scanning and looking for “eyes”. Once “eye’s“are detected the hunter will transition to their scope mounted light set to a higher intensity and “zoomed” for positive identification and shooting. A51iR Bezel Diameter: 44 mm / 1.73 inches. A51iR Body Diameter @ scope mount: 25.0 mm / 1.0 inch. A51iR Weight one battery installed: 10.5 ounces. A51iR Length (bezel in flood): 190.0 mm / 7.5 Inches. A51iR Length (bezel extended to MAX zoom): 200 mm / 7.87 Inches. Warranty: Limited Lifetime on light housing. LED assembly and internal electronics, three years. Accessories (batteries, charger, mounts, tail caps, cases, etc. ), one year. See manual for details and limitations. The A51iR features a full intensity control tail cap with the ability to power the light on at any desired intensity level. The A51iR comes with 850nm Infrared, 940nm Infrared, and Red LED's. The LED assembly is built into a center axis rotational device, allowing the user to instantly change the LED color with the twist of a knob without losing zero in your scope for those wishing to use or experiment with a diffident led color. *Approximate battery life using high quality, fully charged, Wicked Lights 18650 3.7 Li-Ion 2900ma battery. Note: Battery quality varies widely between brands and ma ratings are often grossly exaggerated on cheap batteries. During our testing we noted the Wicked Lights 18650 2900ma batteries would last up to 2 times longer then many private label brands. LED's may begin to dim after long periods of continuous operation (as battery discharges). **Ambient light (moon phase), night vision device quality & power setting, LED color, battery state of charge, background foliage, rain, snow, and size and color of target species will all affect range.